THE LATEST TOP secret unmanned spy plane to be uncovered isn’t just a design idea, it’s already flying at the Air Force’s famed Area 51. Unlike the recently announced SR-72, the new RQ-180 from Northrop Grumman is believed to be currently in flight testing according to Aviation Week and Space Technology. The RQ-180 is a new design aimed at intelligence, surveillance and reconnaissance (ISR, a.k.a. spying) and incorporates stealth technology, in addition to an efficient new design that’s tailored to flights over countries where the red carpet isn’t being rolled out for current U.S. spy drones. It’s the successor to the Lockheed Martin RQ-170 Sentinel, known as the “Beast of Kandahar” for its countless missions out of Afghanistan since 2007. It is assumed the RQ-170 has flown missions over Iran and Pakistan, but the aircraft lacks the endurance of other unmanned aircraft, somewhat limiting its capabilities. Iran displayed what is claimed to be a captured RQ-170 in December 2011. The U.S. Air Force would only acknowledge that it lost control of an RQ-170 over western Afghanistan at the same time. The new RQ-180 is thought to largely address the problem of flying in hostile airspace through improved stealth design and better aerodynamics. 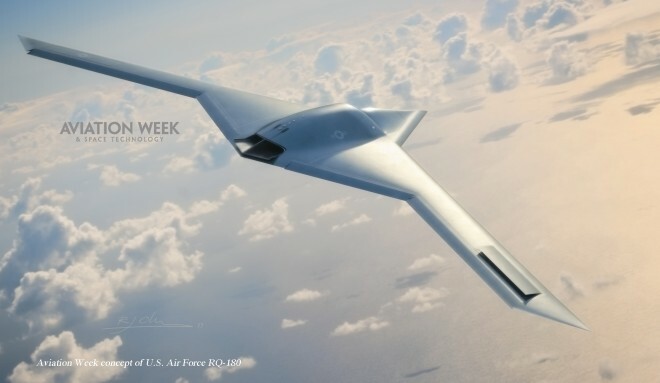 According to Aviation Week, the unmanned spy plane would allow the Air Force to expand ISR capabilities beyond the “permissive environments — such as Iraq and Afghanistan,” where current drones such as the Global Hawk and Predator/Reaper operate. Instead the RQ-180 would be able to fly undetected in airspace where the U.S. does not have permission and/or the protection needed to fly. This denied airspace capability has been missing from the Air Force’s inventory since the speedy SR-71 retired in 1998. The Blackbird mainly relied on its speed and altitude — along with some stealth-like qualities — to fly over countries and gather intelligence where the U.S. was not welcome. The use of unmanned aircraft for spying continues to rise year after year. But most of the work is done by slow flying aircraft such as the Global Hawk and Predators. In addition to flying relatively slow, these airplanes are also far from invisible to radar. Most of their use has been limited to flying over areas where manned fighter aircraft are able to control the skies, providing protection for the vulnerable drones. The RQ-180 on the other hand is expected to have a stealth design with greatly improved aerodynamics giving it greater efficiency, which in the case of ISR work, translates to longer missions which could include longer transits to a target area, or more time over the target. Northrop Grumman has also been publicly flight testing its X-47B unmanned combat aircraft, including take offs and landings from an aircraft carrier. The X-47B is aimed at combat as well as intelligence gathering, and is being developed for the Navy.